Staff and students at the University of Ulster will be attending a free Health and Happiness workshop next week, to learn techniques aimed at helping to enhance their wellbeing, reduce stress and improve inter-personal skills. 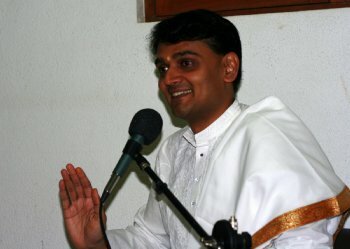 The event has been organised by the Art of Living Foundation, a worldwide organisation which provides courses in practical techniques to calm the mind and heal the body. Art of Living Northern Ireland secretary, Ashish Mathur, is a research associate at the Nanotechnology and Integrated BioEngineering Centre (NIBEC) at Ulster’s Jordanstown campus. He explained: “The event is open to all staff and students at the University and international teacher, Mr Dushyant Savadia, is conducting the workshop. He will be demonstrating meditation and breathing exercises along with light yoga. “These techniques will allow the mind to become relaxed and therefore should help participants to concentrate more, improve their memory and inter-personal skills and focus 100 per cent on their work. They can continue these basic methods at home or in the workplace. “The workshop is just the starting point and if we can get a good response we will organise similar events. We will also be offering follow-up sessions to help people sharpen their life skills. “Mr Savadia has taught Art of Living courses across the world during the past 11 years and we are very privileged to have him conduct this event. The Art of Living Foundation embraces over 150 countries worldwide and more than 300 million people have benefited through its range of seminars, workshops and other projects. The workshop, takes place on Friday, February 4 from 11am until 1pm in the Assembly Hall at the University of Ulster’s Jordanstown campus.